Buy, Sell, and Trade your modern and antique firearms, swords, military relics and sportsman related items at the next NIAGARA FRONTIER GUN SHOWS SHOW! 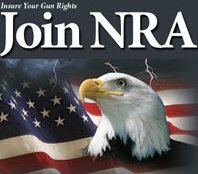 Please use the menu above for more information on upcoming Niagara Frontier Gun Shows events, applications, rules, and more. Niagara Frontier Gun Show’s staff would like to Congratulate newly elected Erie County Clerk Mickey Kearns. 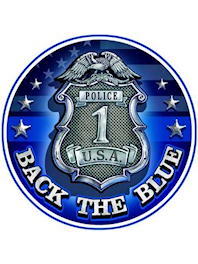 We thank you and your staff for the continued support at the Hamburg Fairgrounds. We all look forward to working with you and the pistol clerk staff at future gun shows. New to the Hamburg Show! 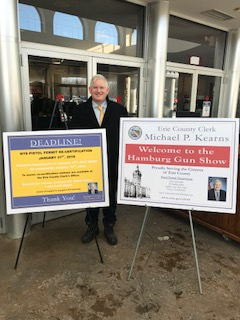 The Niagara County Clerks Office, under the direction of Niagara County Clerk Joseph A. Jastrzemski, is pleased to bring their Pistol Permit Staff to the Niagara Frontier Gun Shows in Hamburg. After many years of building up successful shows with Niagara Frontier Collectors (NFC Shows), we’ve ventured off on our own, starting a new organization, Niagara Frontier Gun Shows (NFG shows). It is our ambition to continue bringing top quality, prosperous gun shows to the WNY and surrounding areas. Thank you for your continued support. New York State law requires that a National Instant Criminal Background Check must be completed prior to all firearm sales or transfers, including sales or transfers of rifles or shotguns. The sale or transfer of a firearm, rifle or shotgun at a Gun Show without first conducting a Background Check is a crime.